Why a Center for Climate Change Communication? Hilary Boudet is an Assistant Professor of Climate Change and Energy in the Department of Sociology at the School of Public Policy at Oregon State University. Her research interests include environmental and energy policy, social movements, and public participation in energy and environmental decision making. She has current studies on the following topics: (1) public perception and community response to energy development – including hydraulic fracturing, renewable energy and liquefied natural gas terminals; (2) community reactions to extreme weather events; and (3) community-based interventions designed to encourage household energy conservation. Before joining the faculty at Oregon State University, she was a Postdoctoral Scholar at the Stanford Prevention Research Center in the Stanford University School of Medicine, where she managed a community-based intervention with 30 Northern California Junior Girl Scout troops aimed at reducing household energy use. 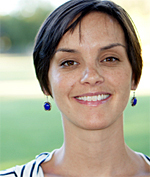 In 2010, she completed her dissertation in Stanford’s Emmett Interdisciplinary Program in Environment and Resources on the factors and processes shaping community mobilization around proposals for liquefied natural gas facilities. Prior to Stanford, Hilary worked for three years as a senior project engineer in the environment and regulatory group at the ExxonMobil Development Company. She holds a BA in Environmental Engineering and Political Science from Rice University. © 2018 Center For Climate Change Communication, George Mason University.